Avro was founded on 1 January 1910 by Alliott Verdon Roe at the Brownsfield Mill on Great Ancoats Street in Manchester. The Company remained based primarily in Lancashire throughout its 53 years of existence with key developmental and manufacturing sites in Alexandra Park Aerodrome, Chadderton (Oldham), Trafford Park and New Hall Farm, Woodford, Cheshire. Edwin Alliott Verdon-Roe (AV) was already known in the early part of the 20th century for his Aeroplane experiments at Brooklands and at Lee Marshes, where he finally achieved his 1st controlled successful flight in July 1909. With production escalating and with a general lack of flying facilities close to the Manchester factories, AV Roe selected The Hamble on the South Coast near Portsmouth as a suitable site for the creation of a new ‘Garden City’, a place where both Aeroplanes and Flying-boats could be built with employees living locally in 450 newly-built houses. Designer Roy Chadwick had joined Avro at Brownsfield Mill in 1911, working initially as the firm’s Draughtsman before moving to their new Avro Experimental Test Station which eventually opened at The Hamble in 1916. 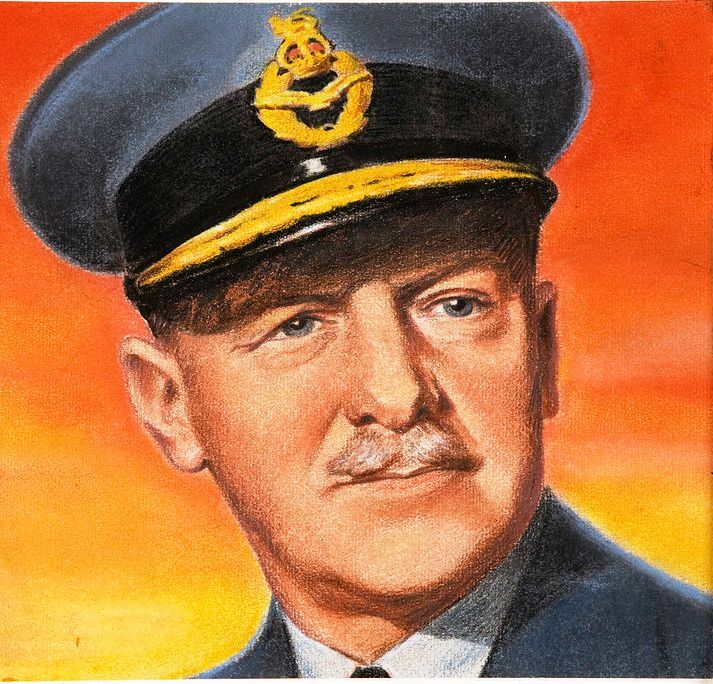 Chadwick flourished in his new environment and from 1918 he took responsibility for a number of Avro designs including the Avro Baby and Avro Avian. In 1924, Alexandra Park closed and their operation moved to New Hall Farm, Woodford, Cheshire which was later to become the Woodford Aerodrome. Meanwhile, production continued at Newton Heath with final assembly and testing carried out at Woodford. During 1928 Alliott Verdon-Roe sold his shares in the Company and with the proceeds purchased The S E Saunders Company and created Saunders-Roe Limited (SARO) based at the Hamble. With the sale of his shares to J D Siddeley, A V Roe & Company became part of the Armstrong Siddeley Development Company, a sister company of Armstrong Whitworth. With AV’s departure from the Company, his ‘Personal Assistant’ Roy Chadwick returned to Newton Heath to take on the role of Chief Designer. The Lancaster, an evolution of the troublesome Avro Manchester, was designed by Roy Chadwick and was powered by 4 Rolls-Royce Merlins, or, in one version, Bristol Hercules engines. A long, unobstructed Bomb Bay meant that the Lancaster could take even the largest bombs used by the RAF, including, the 4,000 lb (1,812 kg), 8,000 lb (3,629 kg), or 12,000 lb (5,443 kg) Blockbusters, loads often supplemented with smaller bombs or incendiaries. 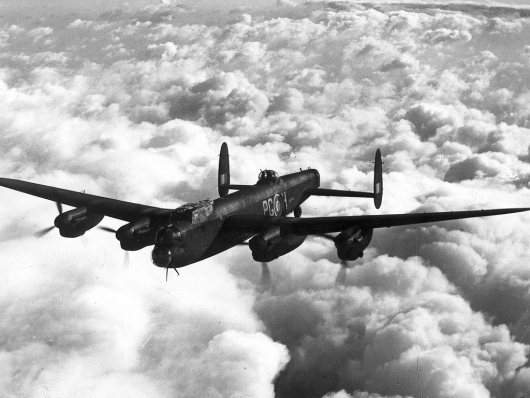 The versatility of the Lancaster was such that it was chosen to equip 617 Squadron, and was modified to carry the Barnes Wallis designed Upkeep “Bouncing bomb” for Operation Chastise, the attack on Germany’s Ruhr Valley dams. Although the Lancaster was primarily a Night Bomber, it excelled in many other roles, including daylight precision bombing: in the latter role some Lancaster’s were adapted to carry the 12,000 lb (5,443 kg) Tallboy and, ultimately, the 22,000 lb (9,979 kg) Grand Slam “earthquake” bombs (also designed by Wallis). As early as 1943, a Lancaster was converted to become an engine test bed for the Metropolitan-Vickers F.2 Turbojet. 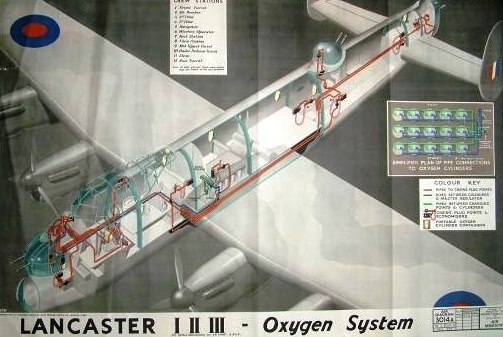 Lancasters were later used to test several different engines, including the Armstrong Siddeley Mamba and Rolls-Royce Dart turboprops, and the Avro Canada Orenda and STAL Dovern Turbojets. Postwar, the Lancaster was supplanted as the RAF’s main strategic bomber by the Avro Lincoln, itself a larger permutation of the Lancaster. Instead, he Lancaster took on the role of long-range anti-submarine patrol Aircraft (later supplanted by the Avro Shackleton) and Air-sea Rescue. It was also used in roles as diverse as photo-reconnaissance and Aerial mapping, as a flying tanker for Aerial refuelling and as the Avro Lancastrian, a long-range, high-speed transatlantic passenger and postal delivery Airliner. In March 1946, a Lancastrian of BSAA flew the first scheduled flight from the then new London Heathrow Airport. Faced with this situation during the summer of 1940, British Prime Minister Winston Churchill threw his support behind the defensive power of the Royal Air Force’s Fighter Command and the development of Bomber Command with the words: “The Navy can lose us the War, but only the Air Force can win it. Therefore our supreme effort must be to gain overwhelming mastery in the Air. The Fighters are our Salvation, but the Bombers alone provide the means of Victory.” With this decision, a massive effort was begun towards the production of heavy bombers and the training of aircrew to fly them. The Avro Lancaster evolved from Britain’s concerns regarding the deteriorating international situation during the late 1930‘s. The Handley-Page Halifax, Short Stirling, and the twin-engined Avro Manchester were all in the planning stages as the War began in 1939. The prototype twin-engined Manchester flew in 1939 but was plagued by instability and problems with its complex, 24 cylinder Rolls Royce Vulture engines. Of the 202 Manchesters built more were lost to engine failure than enemy action. The new bomber was immediately regarded as a success and large production orders were placed. Avro’s production facilities were soon overwhelmed, and numerous other Companies and Contractors joined the effort to produce Lancasters. Consisting of 55,000 separate parts, it has been estimated that 0.5M different manufacturing operations were involved to produce just 1 aircraft. Peak production was achieved during August 1944 when 293 Aircraft were produced. Lancaster’s 1st flew Operationally in March 1942 and were well received by their Aircrew. It was regarded as “a Pilot’s Aeroplane” which inspired confidence. Evidence of this is the story of a Lanc Flight Engineer who, having feathered 2 engines and facing the prospect of flying over several 100 miles of cold, unfriendly ocean, turned to his Pilot and said, “I suppose this means we shall be bloody late for breakfast!” The proven Rolls Royce Merlin engines were much in demand for many types of Aircraft. 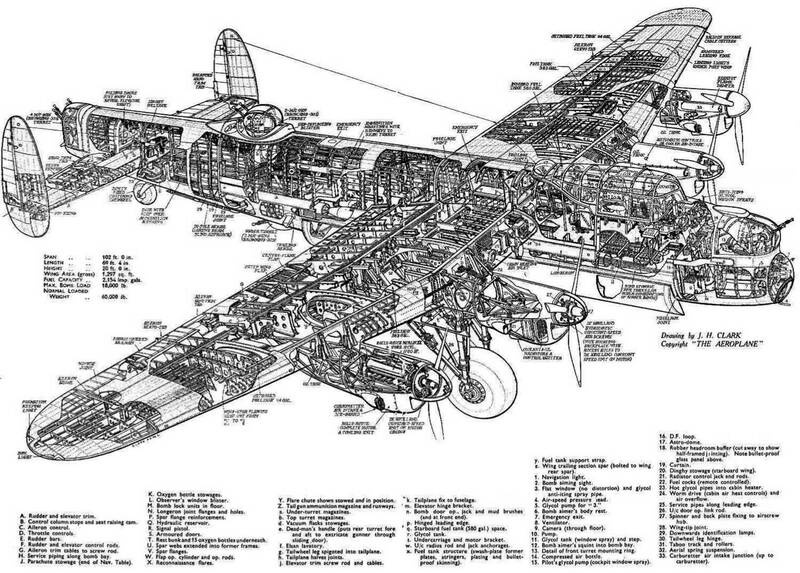 For this reason, a version of the Aircraft was produced which made use of Bristol Hercules Radial Engines. Lancasters were built to accomplish their specific purpose and Crew comfort and security was clearly a secondary consideration. 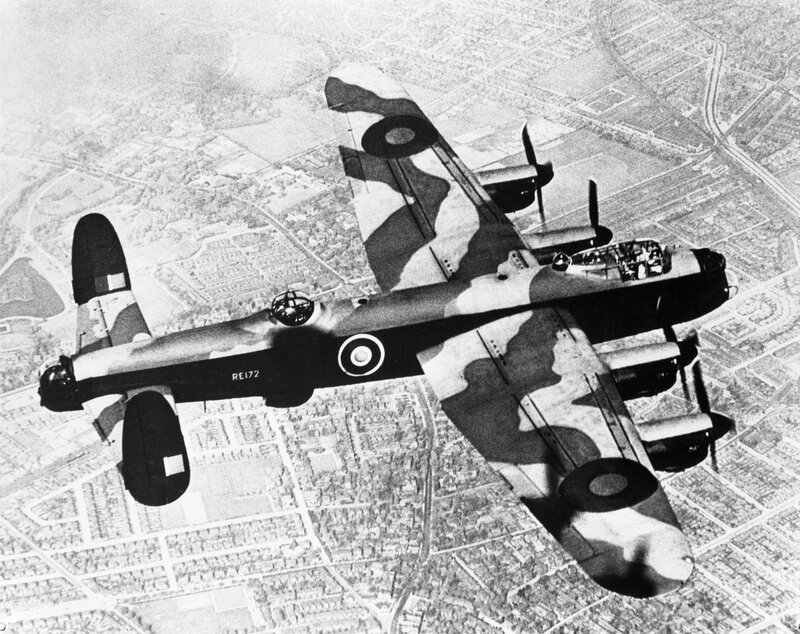 Generally flying under the cover of darkness, the Lancaster had virtually no defensive armour. The front, mid-upper, and rear gun Turrets were hydraulically powered and carried a total of 8 x .303 calibre machine guns for defence against Enemy Aircraft. 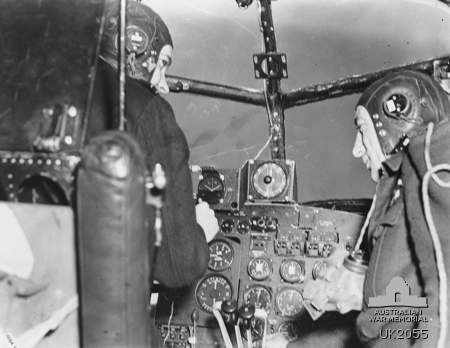 The Crew worked in cramped conditions, particularly the Air Gunners who remained at their posts for the entire flight. Some had to place their flight boots into the Turrets before climbing in, and then put their boots on. At night and at 20,000 ft the temperature in the Turrets frequently fell to – 40°F and frostbite was not uncommon. Air Gunners manned the rear and mid-upper gun Turrets. A Pilot, Flight Engineer, Navigator, Wireless Operator, and Bomb Aimer/front gunner completed the crew of 7. During WW2 the Lancaster was the most successful bomber used by the RAF and the RCAF. The Lanc had speed, ceiling, and lifting power that no other aircraft of the day could match. Weighing 36,900 pounds empty, the Lancaster was capable of taking off with an additional 33,100 pounds of Fuel and Bombs; in other words, it could almost carry its own weight again. The Lancaster carried 64% of the tonnage dropped by the RAF and RCAF during the war. The “Grand Slam“, a 22,000 lb special purpose bomb designed to penetrate concrete and explode below the surface to create an earthquake effect, could only be delivered by the Lancaster and the Lancaster was thus chosen for special operations such as the “Dambusters” raid and the attack which sunk the German Battleship, Tirpitz. The Lanc’s massive bomb bay stretched for 33 ft and, unlike other bombers, was one continuous uninterrupted space. Partly for this reason, the Lanc had the versatility to undertake raids with large, specialized weapons. However, this meant that the main wing spars became obstacles to movement within the aircraft, particularly for airmen wearing heavy clothing and flight boots. With the end of hostilities on all War Fronts, the Lancaster was by no means finished in its service. The RAF continued to use the Aircraft in various roles including Photographic and Maritime duties until October 1956. The RCAF, who flew back many of the surviving Mk.X’s back to Canada, continued to use the Aircraft in photographic and maritime reconnaissance roles until the early 1960‘s. The last 3 RCAF Lancasters were retired at a ceremony on April 1, 1964. The Mark VII, of which the Museum’s Aircraft is an example, was the final production version, with the Dorsal Turret moved slightly forward, and the Tail Turret’s 4 x 0.3 03inch machine guns replaced by 2 of 0.5 inch calibre. This Mark was designed to be more suitable for Operation in the Tropics, as part of “Tiger Force“, the British contribution to the invasion of Japan (and so never being required). The Cockpit. Although this Aircraft, Europe’s only remaining Airworthy Lancaster, has dual controls fitted, Wartime Lancasters had only 1 set of controls, meaning that if the Pilot was killed or badly wounded, the Aircraft was almost always doomed. The Avro Lancaster Bomber was a key weapon of the Allies during the War. More than 7,000 were produced, which flew a total of more than 150,000 missions – from which more than 3,000 planes were never to return. The roar of a Bomber Squadron taking off and returning was a familiar sound to many 1,000s of people living in southern England. The Lancaster remains a feature of events to commemorate the War. She is 69ft 6in long, 19ft 7in high, has a wingspan of 102ft and was powered by 4 Merlin 1,280hp engines. She had a top speed of 287mph, carried a Crew of 7 and could drop up to 22,000lb of bombs. The Crew comprised a Bomb Aimer, who lay in the nose of the Plane, the Pilot, who sat behind and above him, with a Flight Engineer on a collapsible “dicky” seat to his right. Behind were a Navigator, Radio Operator, Mid-upper Gunner and Rear Gunner. RAF Hendon’s Richard Simpson said: “The Lancaster is an iconic plane and this one is particularly important. It’s the oldest, and has the greatest Operational History.” Originally called Q-Queenie, S-Sugar did not take part in the Dambusters raids of May 16, 1943, when the Lancasters flew just 60ft above the water before dropping their deadly cargo. Eight aircraft were lost that day and 53 of the 133 men who took part did not return. •A new book about the Dambusters, Breaching The German Dams: Flying Into History, was published and is available from RAF Hendon. “The name Lancaster became synonymous with the winning of it.” wrote Mike Garbett and Brian Goulding in their excellent book Lancaster at War. Roy Chadwick, Chief Designer of A V Roe, knew from the start that they had a winner. “Oh boy, oh boy… what an aeroplane! What a piece of Aeroplane!” was reportedly his comment while observing the 1st flight of a Prototype Lancaster in January 1941. The 1st RAF Squadron to re-equip with the Lancaster was No.44 Squadron based at Waddington in December 1941. The 1st Lancaster offensive Sortie was made against Essen on the night of 10/11th March 1942. A view of a busy Trafalgar Square in London with a Lancaster bomber on display as a huge crowd gathers to mark ‘Wings for Victory Week‘ in March 1943. The view faces the front of the National Gallery in the background, which has numerous flags of Allied nations flying from its frontage. Roy Chadwick was right in his judgement. The Lancaster was undoubtedly one of the best, perhaps maybe the best of the Heavy Bombers used by the allies during the war, all factors counted. Rugged and reliable. A workhorse being able to carry larger bomb loads than any other bomber used in Europe. And also a Pilot’s Aircraft, pleasant to fly with no handling peculiarities so common to most of the other Aircraft of the period. This single Aircraft made possible the escalation of the night bomber offensive over Germany, and was, according to Sir Arthur Harris, Chief of Bomber Command; the “greatest single factor in winning the war“. The accepted number of total Lancasters produced is 7374. Of this total, 3932 Aircraft were lost on Operations, representing over 20,000 Aircrew either killed, captured or injured. It is now over half a Century since the Lancaster last flew Operationally. The last RAF machines where withdrawn in 1956. The last users, Canadian, French Navy and Argentinean Air Forces retired their last Lancasters in 1964. Today about 20 identifiable Airframes are known to exist in the world. Of these only 2, The Battle of Britain Memorial Flight’s PA474 and the Canadian Warplane Heritage FM213 continue to fly. The remainder are, by and large, persevered in various locations throughout the world. The Avro Lincoln series of British 4-engined heavy bombers arrived too late to see action in WW2. Avro Lincoln RE339 flying test-bed for the Theseus turbo-prop engine. The Theseus was the Bristol Aeroplane Company’s 1st attempt at a gas-turbine engine design, a turboprop that delivered just over 2,000 hp (1,500 kW). A novel feature was the use of a heat exchanger to transfer waste heat from the exhaust to the compressor exit. The engine was soon superseded by the Proteus design with more power, and the only extended use of the engine was in 2 Handley Page Hermes 5 development Aircraft. Following 156 hours of ground runs and the receipt of a test certificate from the Ministry of Supply on 28th Jan 47, 2 Theseus engines were fitted in the outer positions of a 4-engined Avro Lincoln for Air Tests. After ground and taxiing test the Lincoln 1st flew on 17th February 1947. In the late 1940‘s the engine division of the Bristol Factory was heavily involved in gas turbine development. One of their 1st engines the axial flow Theseus engine was long-term tested in a converted Lincoln bomber. The 2 outboard engines were replaced with the Theseus gas turbine turboprop and were then used on regular services to Egypt during 1948-49 to gain experience of turboprop Operation.